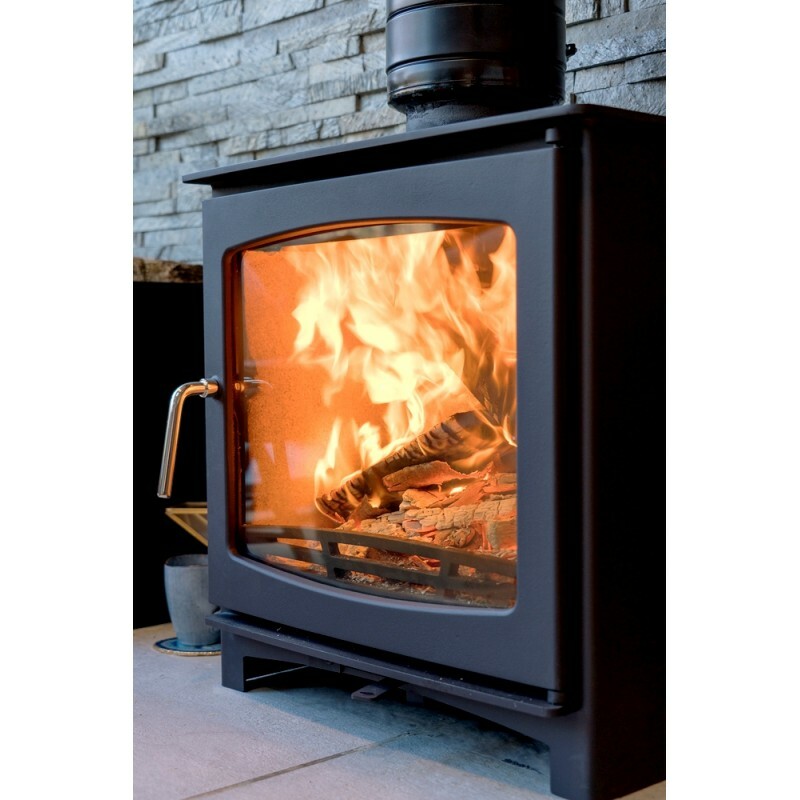 The Defra Approved 5kw Ecosy+ Purefire Panoramic Slimline is one of the most up to date stoves on the market. 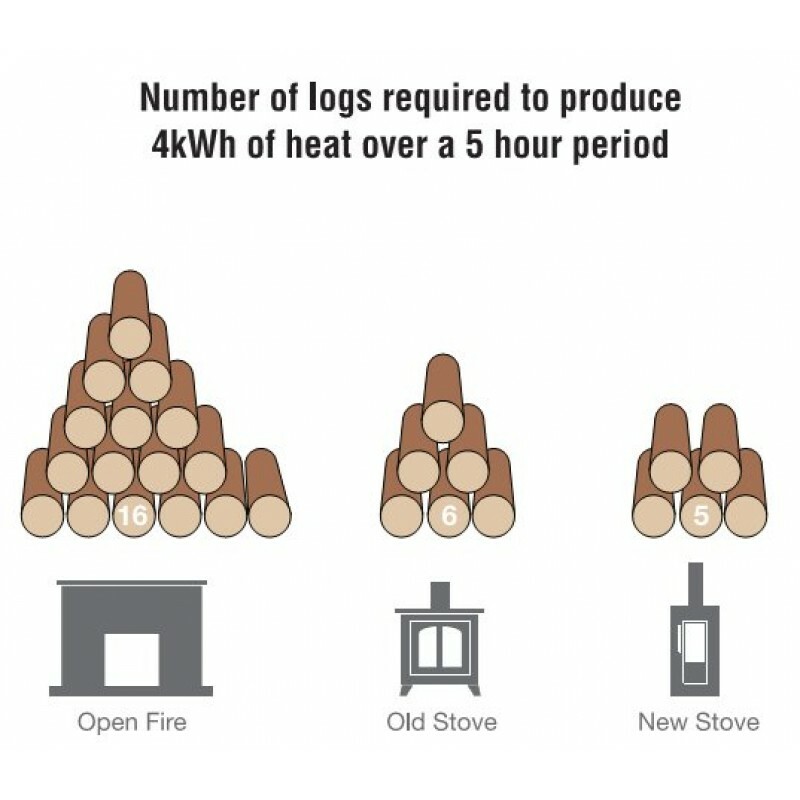 It has been tested and approved to meet the new Eco Design requirements that will be mandatory for all stoves by 2022, making this stove for now and the future. Find out more about the Eco Design scheme at stoveindustryalliance.com. 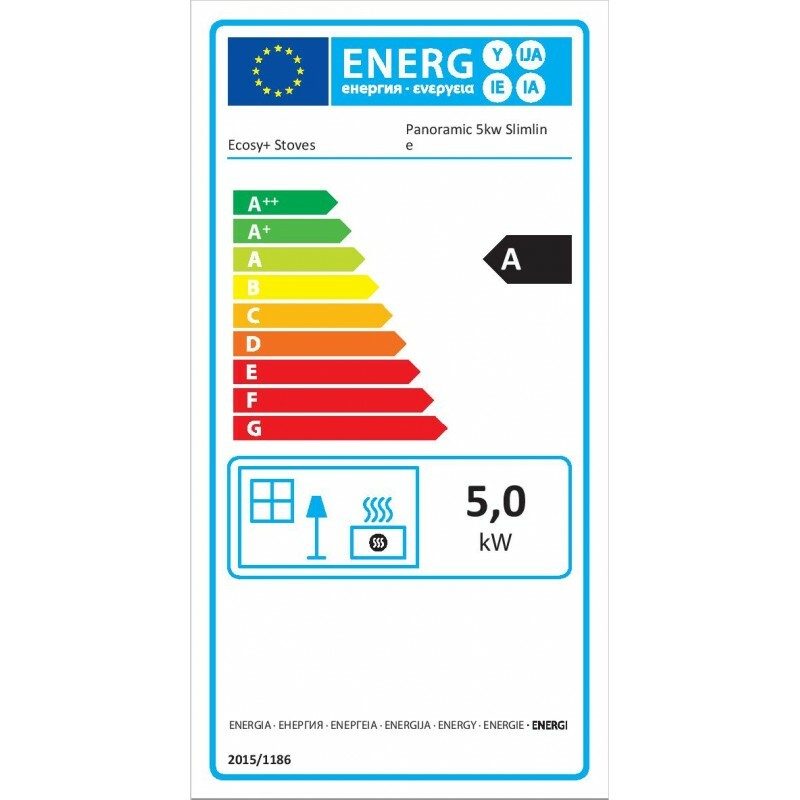 We have had numerous requests by interior designers and installers to produce a neutral, light grey version of the ever popular Panoramic 5kw. 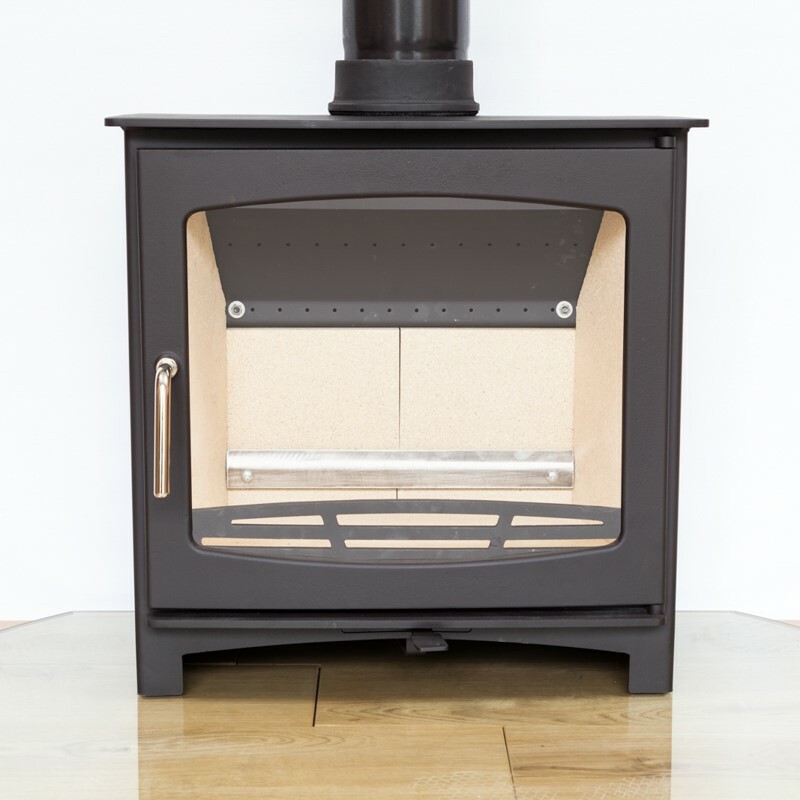 This version is hand-finished by stove professionals here at Stove World UK. The whole unit will be stripped and re-painted with the highest quality Calfire metallic grey paint. Calfire is well respected in the industry because their paints are not only great-looking but highly durable. This stove answers a lot of customers' problems - they need a physically large wood only stove but can only install one with a 5kw output. This has been achieved with this model by clever design. The external body is very wide (560mm) but the depth of the stove is shallow (314mm). 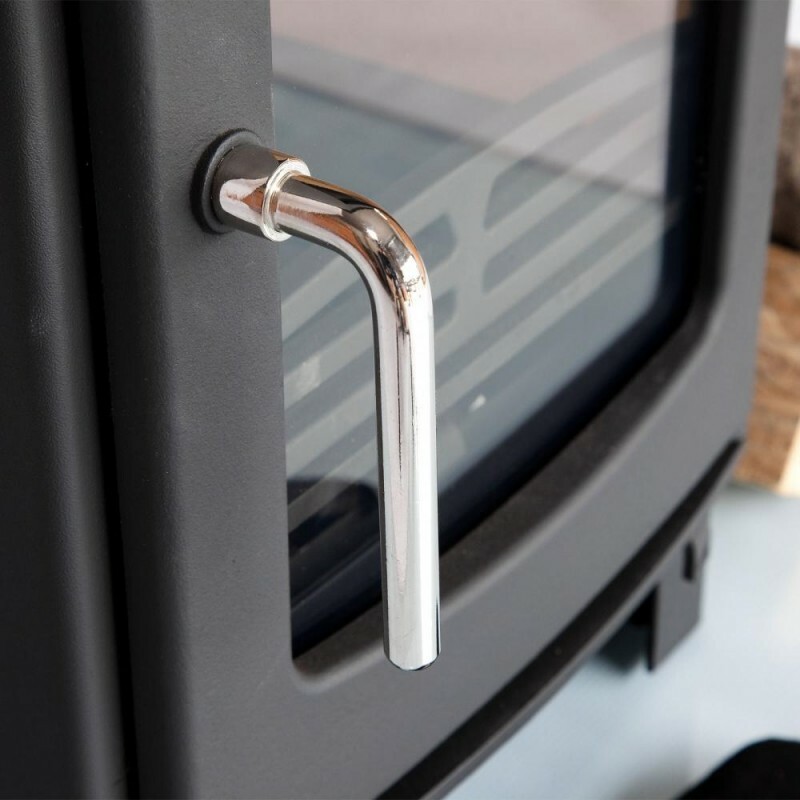 The Purefire also has a twin layer construction - the inner layer has been tapered in at the sides making the fire box slightly smaller and therefore reducing the potential heat output. The firebox is still 400mm wide meaning large logs are not a problem. This version is Defra-approved. Non-Defra-approved version also available. 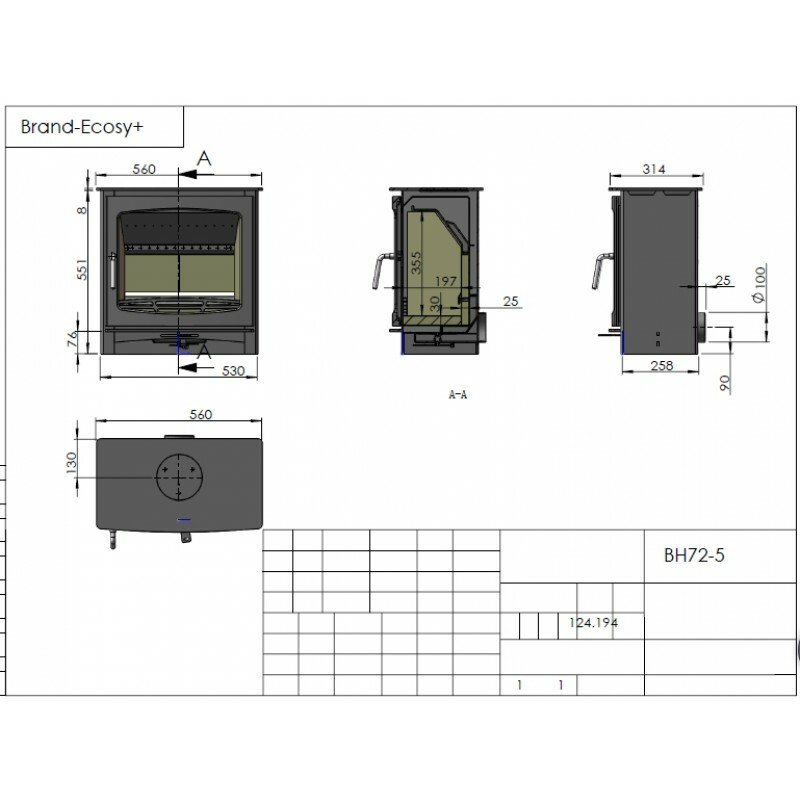 This advanced wood burning stove, suitable for a 12mm hearth, has been designed by Ecosy+ and tested at KIWA Gastec in Cheltenham to CE and British standards along with the new ERP testings for Eco Design. This stove proves there is no need to spend £850+ to get an advanced, good quality stove. Some of the features on this stove include a huge, fully heat-resistant, glass-fronted door that gives an amazing view of the fire. Those of you who have had fires before will know this a big plus of owning a stove. 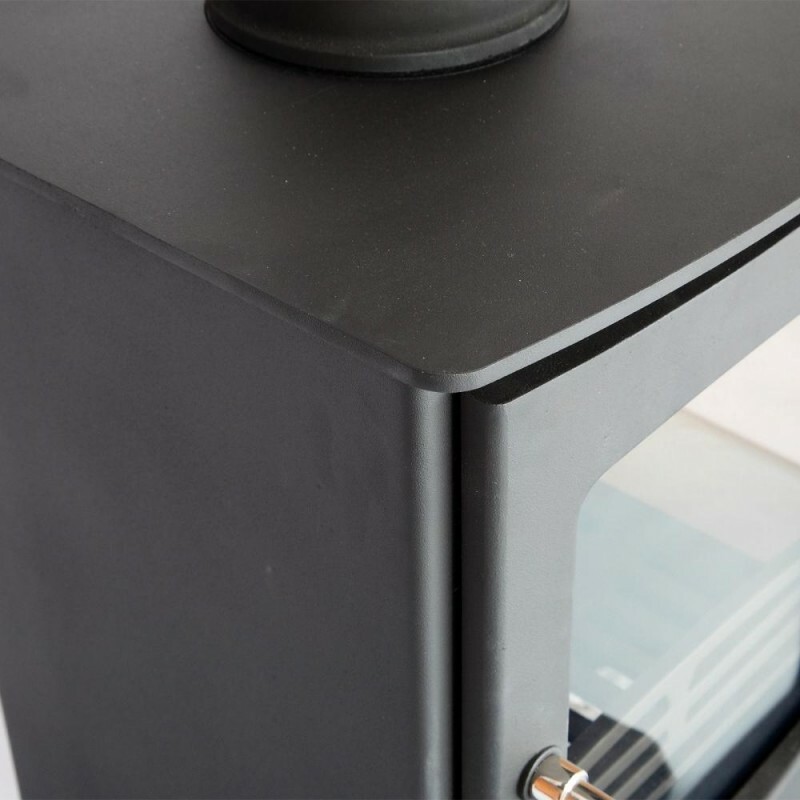 The stove is a fully welded construction that includes a 5mm thick body and 10mm thick top. We are so confident of its quality that we offer a 5 year guarantee; something that is not offered on any other stove around this price bracket. 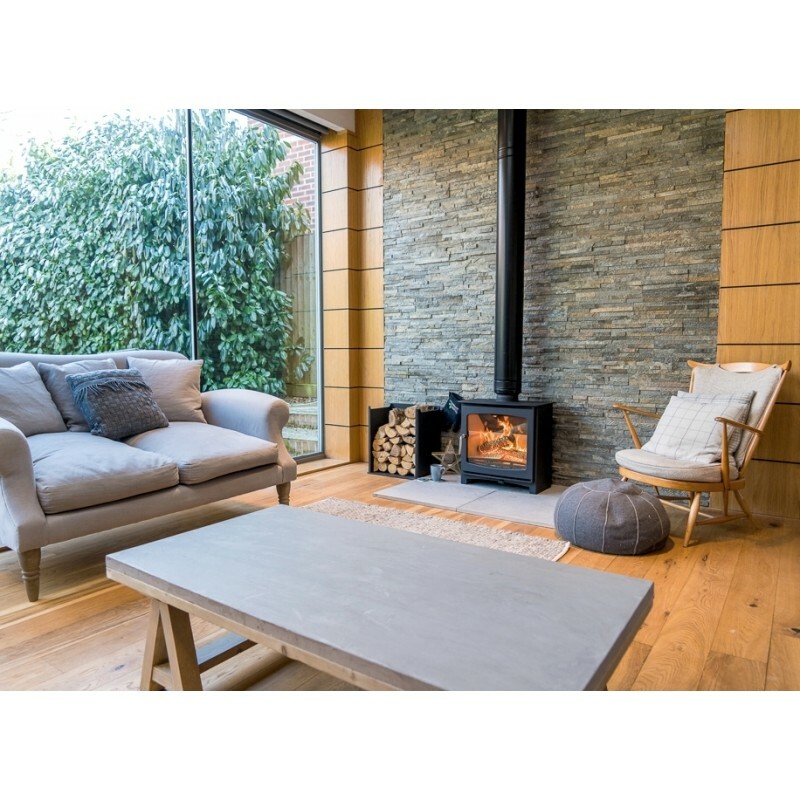 We have tried to give the Defra-approved Panoramic wood burning multi-fuel stove a very minimal aesthetic and have therefore tucked away the air controls under the bottom ash lip which allowed us to increase the glass size for a maximised view of the fire. The stove's air supply is solely drawn in from the rear and regulated by the sliding control on the front. This advanced design makes the stove adaptable for a "direct air feed" which is perfect for new homes. The dimensions of this outlet is 90mm internal diameter and 100mm external diameter. Currently we do not offer any direct air feed kits but these can be found on-line from many retailers. - Note - On a standard install you will not require a direct air feed kit or an air brick installed in the room for this stove. This will only apply for new builds. We also have a stand/bench available for this stove via the link below. The stand is 275mm high and will provide log storage as well as increasing the stoves height. This version will be hand-finished by stove professionals here at Stove World UK. The whole unit will be stripped and re-painted with the highest quality Calfire metallic grey paint. Calfire is well respected in the industry because their paints are not only great-looking but highly durable. Further information available here. This version of the 5kw Panoramic has been rigorously tested and approved to burn wood in a smoke controlled zones. Defra approved stoves with 5" flue outlets, like this one, can also be installed with a 5" liner. The Defra approval has been achieved by factory fitting a mechanical stop to prevent secondary air closure beyond the 31mm open position. When ordering over the phone please specify that you require the DEFRA version. If not you may be sent the non DEFRA unit. FREE Ecosy+ printed over glove. Height : 551mm, 21.69 inches. Depth : 314mm 12.36 inches. 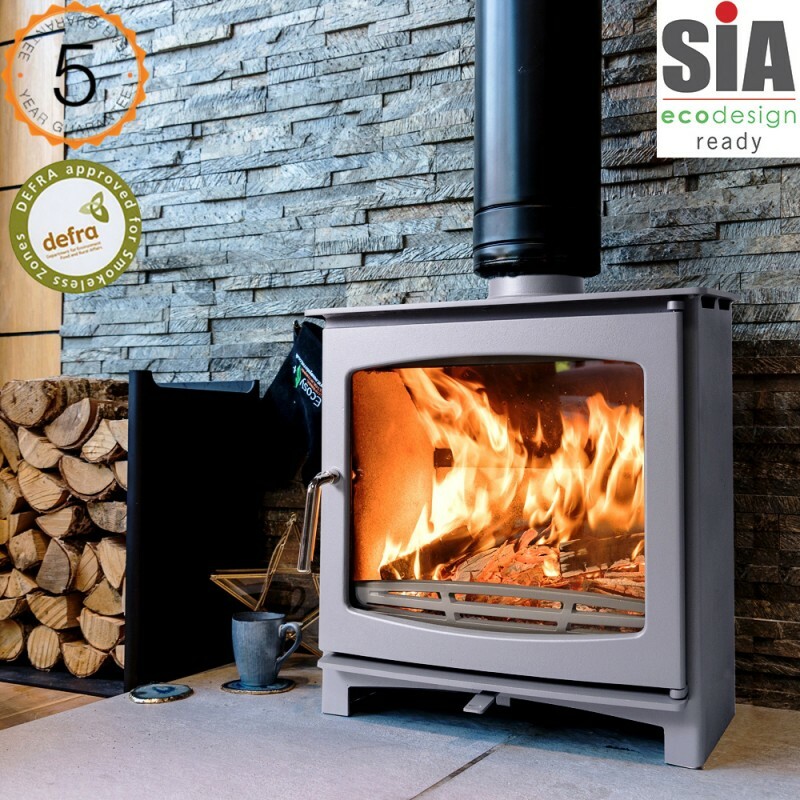 Please note that this is the price for delivery of Custom Grey Defra Approved 5kw Eco Design Ready (2022) - Slimline Ecosy+ Panoramic Woodburning Stove - 5 Year Guarantee only. The final amount might change depending on the contents of your shopping bag when you check out.